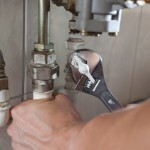 Top 3 Reasons DIY Drain Repair is Not a Good Idea | A Step Above Plumbing Inc. Top 3 Reasons DIY Drain Repair is Not a Good Idea | A Step Above Plumbing Inc.
With so much information available on the internet, many individuals have convinced themselves they can be a trade of all jacks and do any job by themselves. While there are certainly some smaller plumbing fixes that you would benefit from learning, it’s important to leave big jobs to the professionals. There are several reasons why this is advisable, but below we’ve just given a few details about trying to do drain repair on your own. 1. Pouring chemicals down the drain to try and repair the problem usually doesn’t work, it exposes you to dangerous chemicals, and it can damage the pipes themselves. 2. You could have a more serious problem than you realize and without involving a professional plumber, you might not be aware of how to recognize them and adequately fix them. 3. DIY drain repair usually ends up costing more. By having a plumber come to fix whatever problems you’re having, you’ll pay a nominal fee to get the job done. If you try to fix it yourself, you’re likely having to purchase tools you don’t have and risking the chance of causing even further damage. Plumbing fixes gone wrong could lead to flooding or more expensive repairs, which is the last thing that you want to deal with. Keep these in mind next time you need drain repair, and make sure that you’re consulting a professional to get the best possible results.